Lyprinol® contains a unique grouping of rare omega-3 fatty acids derived from the non-polar lipids of New Zealand’s green lipped mussel (perna canaliculus). This combination of omega-3 fatty acids is unique to this species and is not found in any other variety of seafood. All mussel farming and processing in the Marlborough Sounds is strictly controlled by New Zealand’s Ministry of Agriculture and Fisheries (“MAF”) to ensure that mussels conform to the highest quality standards. The Marlborough Sounds are regularly monitored to ensure that mussels are grown in clean, unpolluted waters. 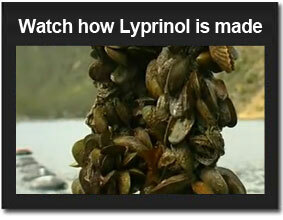 The mussels from which Lyprinol® is extracted take around a year to grow to the desired length of 80mm. When they are harvested they must be rushed to the factory and processed immediately to ensure that all the important lipids are fully protected. The mussels are stabilized and then freeze-dried, which is essential for the subsequent extraction of the non-polar lipids in the mussel. The processing plant conforms to the highest quality control standards, which are strictly regulated and enforced by MAF on behalf of the United States FDA and EU authorities. After the stabilized mussels have been freeze-dried into powder, they are shipped to a factory for the extraction of Lyprinol®. 1. Green Lipped Mussels or Greenshell Mussels are farmed in the Marlborough Sounds. They are suspended from long-lines supported by buoys. 2. The mussels are grown on ropes attached to the long- lines in the pristine waters of the Marlborough Sounds. 3. Mussels are sorted aboard the harvesting barge to ensure that only the highest quality mussels are processed to extract Lyprinol®. 4. Fully-laden harvesting barges head for port, carrying over 80 tons of fresh mussels for immediate processing. The harvesting of mussels commences in the early morning and continues until mid afternoon. The harvested mussels are packed in 1-ton sacks for transport to the processing plant where they are stored at 4°C. Processing commences immediately as the mussels arrive in the plant and it is completed within 24 hours, ensuring that the mussels are in peak condition. The mussel flesh is stabilized, which protects the non-polar lipids (Lyprinol®) prior to freezing in special stainless steel trays designed specifically for the freeze-drying process. Freeze-drying, which is also known as lyophilising, is a process where the moisture is removed from the product under vacuum without the application of heat. The now dried mussel flesh is removed from the freeze dryer as a thin biscuit with a moisture content of less than 2%. It is immediately transferred to a humidity-controlled room where the biscuit is first broken down to smaller parts and then ground to a fine powder in a specifically designed mill. After grinding, the powder is packed into heat sealed aluminium foil bags and nitrogen gas is inserted into the bag by a special process. This removes any residual oxygen, thus ensuring an ideal environment during transport of the powder to the final processing plant in Germany and New Zealand where the lipids are extracted. Note: Limited information is available in this section due to the confidential nature of the extraction process. Lyprinol® is derived from stabilized green lipped mussel powder via use of the supercritical fluid extraction process. All the stabilized mussel powder is forwarded to the German based company, Flavex Naturextrakte or Nutri-Zeal in Nelson, New Zealand, who are both internationally renowned for their expertise in the field of supercritical fluid extraction. Lyprinol® is a source of long chain omega-3 polyunsaturated fatty acids which are essential for health in humans. The two main omega-3 PUFA’s present in Lyprinol® are eicosapentaenoic acid (20 carbons and 5 double bonds, shorthand =20:5 omega- 3) (EPA) and docosahexaenoic acid (22:6 omega-3) (DHA). It also contains several other fatty acids, which belong to the omega-3 PUFA family. These fatty acids all have four double bonds and have carbon chain lengths of 18, 19 and 20 carbon atoms, respectively, thus they are described as 18:4 omega-3 (18:4n-3), 19:4 omega-3 and 20:4 omega-3 (ETA). The Importance of Stabilization Stabilized or Unstabilized: The Important Difference! In the case of New Zealand green lipped mussel powder, stabilized means that the powder contains active non-polar lipids. Unstabilized means that the powder contains little or no active non-polar lipids, because they have been destroyed by the process of oxidation. Over many years the New Zealand green lipped mussel has received an array of both positive and negative appraisals in relation to its anti-inflammatory ability. The reason for this inconsistency is quite simple, so it is important that we clarify it from the very beginning. Based on original evidence, it was perceived that the mussel could be consumed by way of freeze-drying the mussel into a powder form. It was also believed this would provide the same benefits as raw mussel flesh. This did not prove to be correct and it became quite obvious that the active components were lost somewhere in the processing. Research found that the poor results were caused by the oxidation of the non-polar lipids when they were exposed to air or heat. Nearly all production houses use heat to open the mussel shell so the meat can be removed. Unfortunately the first medical studies were conducted on poor quality mussel powders. They produced conflicting results and subsequently damaged the name of the green lipped mussel in the International medical community. Once the Australian MacLab Group developed a process to stabilize the non-polar lipid activity before the freeze-drying process took place, it was only then the true value of the mussel became evident. Note 1: There is only one producer of stabilized mussel powder in the world, MacLab/Biomex Pty. Ltd., which is part of the Maclab Group based in Melbourne, Australia. Maclab/Biomex channels this production of stabilized powder only to Pharmalink International Limited for the development of Lyprinol® for human consumption. The reputation being built by stabilized mussel powder and by Lyprinol®, may well have consumers expecting the same result from unstabilized mussel products. The consumer must therefore be protected by being made aware of the difference between these products. If a person says “I used New Zealand green lipped mussel and it did not work for me”, the chances are he used the non-stabilized mussel powder and not Lyprinol®. Note 2: There are no regulations we know of that police the use of the word “stabilized” on packaging. Some basic green lipped mussel powders produced by other companies use the word “stabilized” on their packs but they are referring to another stabilizing process. To ensure that the word stabilized means “active non-polar lipids” (i.e. 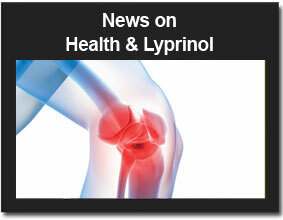 anti-inflammatory activity), consumers are advised to only consume pure non-polar lipid fractions known as Lyprinol®. Stabilized mussel extract (Aust.) is vastly superior to the unstabilized mussel extract (NZ/UK). Research in Australia and Japan proved that the then currently available freeze-dried powder was unstable and a stabilized process to protect the activity was developed by Biomex Australia. This mussel powder should not be confused with any of the currently available mussel powder products sold in the UK and Europe, including those produced by McFarlane New Zealand under the brand name Seatone®.